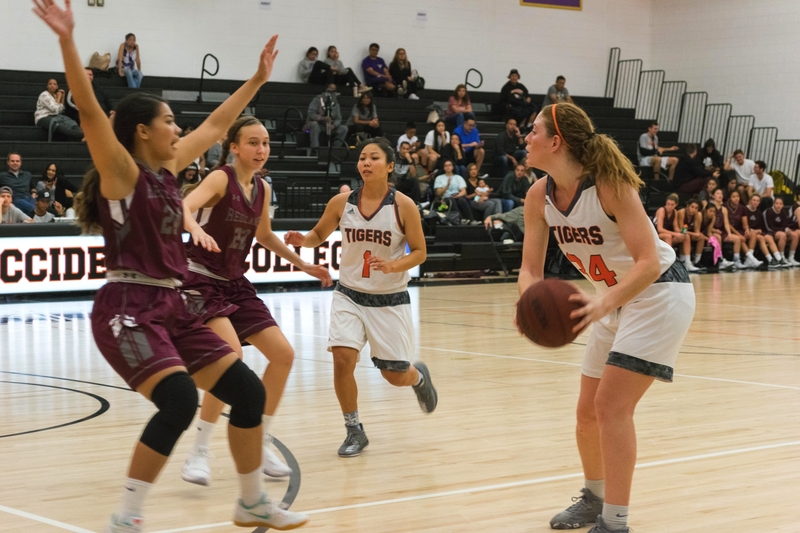 The Occidental women’s basketball team won a double-overtime thriller against the University of Redlands in Rush Gymnasium Saturday, Dec. 2, with a score of 71–69. This win brings the Tiger’s record to 4–1 overall and 1–0 in the Southern California Athletic Conference (SCIAC). Tala Ismail (sophomore), Alyssa Ramlochan (first year) and Shariah Green (sophomore) led the team’s performance in Saturday’s game while Emily Leonard (sophomore) scored an open layup as time expired to secure the victory. The Tigers earned victories over La Sierra University Nov. 18, Bethesda University Nov. 20 and Lewis & Clark College Nov. 24 before falling to Augsburg University Nov. 25. Head coach Anahit Aladzhanyan attributed the team’s current winning record to an aggressive style of play, both offensively and defensively. The Tigers’ incessant pressure on both sides of the ball has translated to an average of 68.6 points per game, a 40.2 percent field goal percentage and an undefeated record at home. According to Aladzhanyan, senior leadership coupled with young talent has many on the team hopeful for the rest of the season. “It’s nice to have a senior group with experience and a younger group who are eager, talented and will contribute right away,” Aladzhanyan said. Aladzhanyan said that the game against the Redlands served as a true test for the Tigers. Redlands has perennially been a team in contention to make SCIAC playoffs, according to Aladzhanyan. Ismail led the Tiger’s victory against Redlands, tallying 27 points, 10 rebounds and five steals. Ramlochan contributed 11 points while Leonard and Green both finished with 10 points. According to the Occidental Athletics website, Green has led the Tigers with 14.8 points per game this season. Ismail has scored 14.4 points per game, while Triana Anderson (senior) has 12.5 points per game. According to Green and Anderson, they are excited about the team’s prospects for the rest of the season. Coming up on her final season, Anderson is especially happy with the contribution of younger team members. Tigers are looking to make the leap into the SCIAC tournament, which has been dominated by a small group of top teams. According to Aladzhanyan, the team’s ability to limit and withstand scoring runs from their opponents has been key to their success. The coaching staff keeps record of “kills,” which are when either team scores on three or more consecutive possessions. The next women’s basketball game will be Wednesday, Dec. 6, at California Lutheran University against the Regals.